Goals from Leroy Fer and Memphis Depay were enough for Louis van Gaal’s side to pick up a third consecutive win. 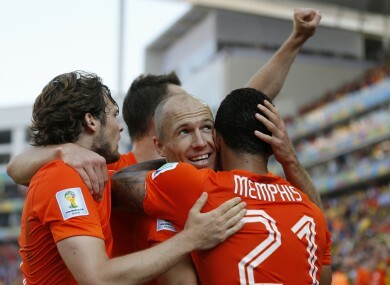 Goalscorer Memphis Depay is congratulated by Arjen Robben. SUBSTITUTES LEROY FER and Memphis Depay scored to ensure the Netherlands finished top of Group B with a 2-0 win over Chile in Sao Paulo on Monday. That result is expected to see the Dutch avoid Brazil, whose Group A campaign ends later on Monday against Cameroon in Brasilia. Both the Netherlands and Chile had already secured their second round qualification after posting wins over Australia and reigning champions Spain. The best moment from an otherwise sterile first half saw Arjen Robben set off on a mazy run from half way and beat several players before dragging his shot wide of the far post. Stefan de Vrij should have given the Netherlands the lead when he dived to meet a Robben free-kick but he contrived to miss the target from four yards out. Robben at least seemed determined to add to his tournament-leading three goals and he came closest for the Dutch after the break with a low shot after another driving run, Chile goalkeeper Claudio Bravo getting down well to parry though. Just before that Chile’s Alexis Sanchez had befuddled Daley Blind wide on the left before firing from a tight angle straight at goalkeeper Jasper Cillessen. Depay injected some urgency into the Dutch play with a rasping drive that Chile captain Bravo tipped over the bar. But he could do nothing about Fer’s header, his first touch after coming on, from the resulting corner routine moments later. Depay sealed the win in injury time after sliding in at the back post to convert Robben’s cross. Email “Robben inspires victory against Chile as Dutch claim top spot”. Feedback on “Robben inspires victory against Chile as Dutch claim top spot”.